Lisa Unger knows a thing or two about strong women, In her new book, THE RED HUNTER, these women are fighters, warriors, and survivors. They’ve been knocked down and pick themselves up again and persevere. So in honor of Women’s History Month this March, Lisa discusses below how these charters came to be and how everyday women influence her characters. My friend Ace Atkins is an extremely talented, bestselling writer of crime fiction. Whether he’s writing about the former U.S. Army Ranger Quinn Colson or ex-football player Nick Travers, or Robert Parker’s iconic Spenser, he explores a slew of very tough characters – from the depraved to the heroic. So, it was with some trepidation that I sent my new hardcover THE RED HUNTER. Would it be up his alley? It got me thinking about toughness, what it means to be truly strong. In crime fiction especially there’s this idea of the detective or cop, racing after bad guys, carrying guns, and throwing punches. There’s an expectation of non-stop action and conflict – fights and chases. It’s very exciting for the reader – and the writer. But I’m not sure it’s how willing we are to throw a punch or pull a gun that makes us tough. It might be that true grit comes from surviving pain and growing from it, rather than collapsing under its weight. Toughness dwells in the moment not when you’ve delivered a blow, but when you’ve taken one and you’re on the ground, bleeding. Do you get up or stay down? It’s what we do in that dark moment that is the measure of our strength. March is Women’s History Month, a time when we honor the grit and strength of women who endeavored to and often succeeded in changing the world. From suffragettes to soldiers, from teachers to doctors, from laborers to protestors, we honor the women who refused to sit back and be told what they could and couldn’t do. In the face of often violent opposition, these women took blows, and stood back up. But beyond iconic figures in history, in the day-to-day of my own life, the strongest people I know are women – artists, writers, politicians, business leaders, teachers. And, of course, mothers – the most powerful women of all. Because to be a mother takes endless patience, the ability to subordinate needs and wants in the interest of our children. It’s a twenty-four-seven enterprise that often leaves us frazzled and sleep deprived. There are endless blows – to the heart (it hurts to love so much), to the ego (You don’t work? ), to sanity (Mom! I can’t sleep!) – but good moms get up every time. And let’s not even talk about childbirth. That’s where we really separate the women from the boys. When I write about tough women, and I do, they aren’t necessarily carrying guns or getting into fights – though they do all that, too. The women who populate my novels – young, old, writers, psychics, cops, wives, mothers, doctors – are all very different from each other. Some are powerful, some traumatized. Some have unexplained gifts. Some are bent on revenge; some seek peace after pain. But they all know what it means to take a hard blow, get up bleeding, and start swinging. They refuse to stay down. They fight back. They move on. They live the Japanese proverb: Knock down seven, stand up eight. Like all truly tough women in history and fiction, they’re survivors. Who are your favorite tough women – in life or in novels? How have they inspired you? “An instant page-turner” (Lisa Gardner) that straddles the line between thriller and horror...“sure to appeal to a wide range of readers, including Stephen King fans” (Booklist, starred review). A young woman’s mysterious gift forces her into the middle of a dangerous investigation of a little girl's disappearance.Twenty-year-old Finley Montgomery is rarely alone. Visited by people whom others can’t see and haunted by prophetic dreams she has never been able to control or understand, Finley is terrified by the things that happen to her. When Finley’s abilities start to become too strong for her to handle—and even the roar of her motorcycle or another dazzling tattoo can’t drown out the voices—she turns to the only person she knows who can help her: her grandmother Eloise Montgomery, a renowned psychic living in The Hollows, New York. Merri Gleason is a woman at the end of her tether after a ten-month-long search for her missing daughter, Abbey. With almost every hope exhausted, she resorts to hiring Jones Cooper, a detective who sometimes works with psychic Eloise Montgomery. Merri’s not a believer, but she’s just desperate enough to go down that road, praying that she’s not too late. Time, she knows, is running out. As a harsh white winter moves into The Hollows, Finley and Eloise are drawn into the investigation, which proves to have much more at stake than even the fate of a missing girl. As Finley digs deeper into the town and its endless layers, she is forced to examine the past, even as she tries to look into the future. Only one thing is clear: The Hollows gets what it wants, no matter what. What is the difference between justice and revenge? In this buzzworthy new standalone thriller by New York Times bestselling author Lisa Unger, two wronged women on very different paths find themselves in the same dark place…Claudia Bishop’s perfect life fell apart when the aftermath of a brutal assault left her with a crumbling marriage, a newborn daughter, and a constant sense of anxiety about the world around her. Now, looking for a fresh start with a home restoration project and growing blog, Claudia takes on a crumbling old house—one that unbeknownst to her has an ugly history and may hide long buried secrets. For Zoey Drake the defining moment of her childhood was the horrific home invasion murder of her parents. Years later, she has embraced the rage that fuels her. Training in the martial arts has made her strong and ready to face the demons from the past—and within. Strangers to each other, and walking very different paths in the wake of trauma, these two women are on a collision course—because Zoey’s past nightmare and Claudia’s dreams for her future take place in the very same house. As Zoey seeks justice, and Claudia seeks peace, both will confront the monsters at the door that are the most frightening of all. 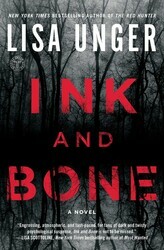 That’s why I really admire Lisa Unger’s characters. The female characters aren’t perfect or tough to begin with. They work through, often times, extremely dark pasts, and find the strength to continue on. My mom is my real-life Wonder Woman! She’s gone through a lot and somehow remains strong and positive.